Naturally appealing and versatile, 50 gallon Bamboo Beacon Hill Planters adeptly spruce up landscape atmospheres. Utilizing a bamboo body design, the vertically or horizontally placed slats offer optimal structural integrity and 20% more stability in climate-temperature changes than other timber material. The large capacity planter is banded together with a powder-coated frame aluminum, topped by a lift-off steel lid, providing convenient access to the 2 individual 25 gallon plastic liners. 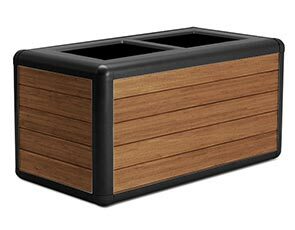 Configured to accommodate indoor and outdoor environments, Beacon Hill Planters come standard with adjustable rubberized feet and 1/2" pre-drilled holes in the base for secure, diverse installations.